And just like that, Valentines Day is over. Blame it on my dad who without fail had a sweet limerick and a single red rose delivered to my sister and I each Valentines Day…I am a sucker for flowers and a heartfelt card on the “holiday.” But as an adult I have found that there is so much about the day that sits a little wrong with me. Social media has made it almost into a game – who had bigger flowers delivered to their office, who got nicer gifts and which retailer makes the most money. Where is this love and attention the rest of the year? Being in a serious relationship takes work each and everyday. While falling in love can often be the easy part, keeping that love and romance alive needs more than the attention that you give your partner on February 14th. 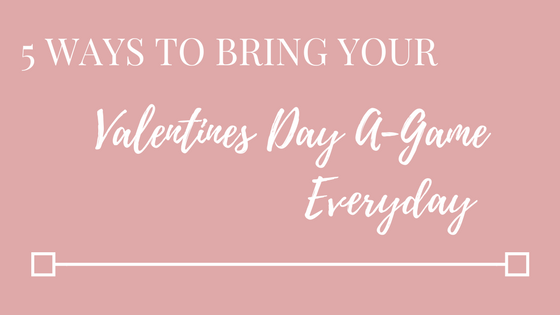 For all of us that have a bit of a Valentines Day hangover, I wanted to share our favorite five ways to bring your Valentines Day A-Game through out the year to your sweetheart. Then make sure that you follow through in your actions. I am sure most of you have at least a general idea of what the story is behind what Love Language is all about but I think that this is one of the most important and often overlooked pieces in a relationship. There are 5 elements of love languages: words of affirmation, acts of service, gift giving, quality time, and physical touch. These represent how you communicate love and how each effects you emotionally. My husband and I have more in common in the quality time area but the rest of our profiles could not be more different when it comes to how we receive and perceive love. Where I am more emotionally connected to physical touch and gift giving (yes, I will be the old lady in the nursing home that has GIVE HER DAILY HUGS on my file) Jason scores higher on the acts of services and words of affirmation…. meaning that when I take chores or tasks off of his laundry list of things to do and tell him how awesome he is, he gets ALL THE FEELS for me. ? While I tend to need my hand held, kisses and hand written cards to feel the same connection. Taking time to realize that we are each very different creatures when it comes to our Love Languages has helped us connect on a more personal level, increase our communications and help us through some of the more difficult moments in our marriage. Want to find out your love language? Click the link at the bottom the post to take the test, you might surprise yourself! At some point in your relationship, you might realize that you have taken your partner for granted or not given them the recognition that they need or deserve. It happens to all of us! One sure fire way that you can make sure you aren’t taking them for granted is to create a Gratitude Journal. Oh and just as important, you need to write in it! You don’t have to write long love letters in this but taking time to write in it a handful of times a week, preferably at the start of your day, will help you keep the positive and amazing things that you have in your life and relationship at the front of mind. Its important to note that you should put these things on paper and not just go through the exercise in your head because you want to enjoy and savor the good emotions that come with these thoughts. Don’t be afraid to share some of the things that you are grateful for with your love! Not only will this help in your relationship foster positive communication and emotions but a study from Yale shows that keeping a gratitude journal will result in higher alertness, enthusiasm, determination, attentiveness, and energy. All of which makes for a happier marriage and relationship! Blah Blah Cory, we all know its important to talk! I know this is common sense but I think that it is important to have a little reminder every once and a while to keep this as a constant on your calendar. Have you ever looked back at a busy week and thought, I didn’t see or talk to my significant other much at all. I like to jokingly refer to this as us being “ships passing in the night.” I tend to carry more stress and have less energy on weeks like this. Knowing that my husband works late and often times leaves all of his energy on the field that day means that in order for us to have time to actually talk each day we have to be creative with our scheduling. I happily give up that extra 30 minutes of sleep in the morning so that we can walk our dog or drink coffee together with no distractions. We can talk about what our day is going to look like, make plans and just simply enjoy each others company. Think about your daily schedule, do you set aside time to communicate and spend time together? Stop letting the idea of how things should go, ruin what is actually happening right in front of you. I have a bad habit of building up an event that we have planned or a moment ahead of time and when things don’t go as planned, its a hard pill for me to swallow. An area of my personal life that I am constantly working on is to enjoy the amazing moments that are unfolding in my relationship, planned AND unplanned. When you embrace the fact that rarely anything in life goes as you plan, you will find that there is so much beauty and fun being created that is all part of your very own and unique love story. Take time to celebrate and recognize the awesome things that your partner does. From the big moments of great achievements to the little things that are knocked off their lists. Creating an environment in your relationship that nurtures successes both big and small will help you as a couple capitalize on the good times and create a tighter bond between the two of you. Cracking open a bottle of nice wine because one of you hit a milestone at work or picking up a cupcake at the store to commemorate the day someone wrapped up a big project. Whatever your way of celebrating each other can be so inspiring. Since typically positive events out weigh the negative ones, by amplifying those moments with the acknowledgement of your partners success you are showing your support to your loved one. Bottom line, it is easy to get wrapped up in being busy. Life gets hectic and whether it is planning a wedding, work or other commitments, it is easy to let the one constant thing – your relationship – fall to the side because you know that they will be there when you aren’t so busy. But what would our quality of life look like if we spent time putting our most important relationship at the top of our priorities on a daily basis? Our Bells Box challenge for you is to spend time focusing on bringing your A-Game EVERYDAY to help nurture a healthy and happy relationship for the long run! Below is the link to test your love language! Were your or your significant others results a surprise to you? Let us know in the comments below!